Lovers Call Oil-Call In a Lover, Keep Their Attention! Our Products >> Lovers Call Oil-Call In a Lover, Keep Their Attention! Welcome! 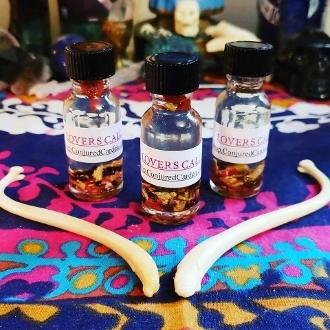 This oil is designed to get attention and results from either someone you already know or to put the call out for a new lover! Designed to bring about communication, reciprocity, emotional bonding, physical meetings and positive exhcnages with each other. Use on a pink figure candle of the gender you wish to attract or where on your pulsepoints when out in public. You can also add it to your bath and conditioner to wrap yourself in an enveloping aura of love drawing magic!